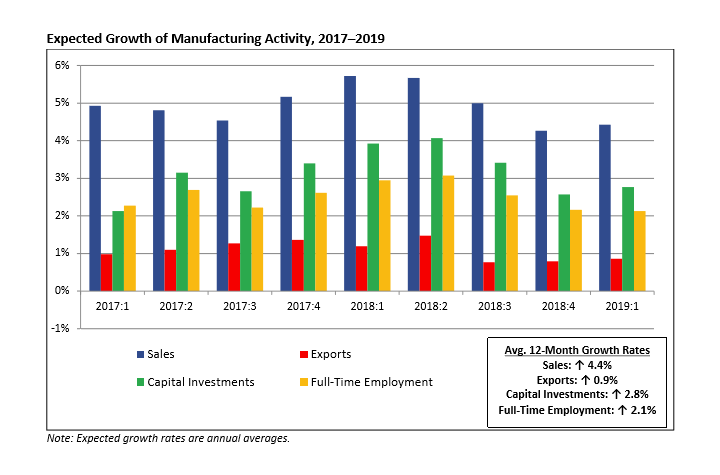 The National Association of Manufacturers posted their 2019 first quarter outlook survey results, see below. The survey shows that this is the ninth consecutive quarters of record optimism, with an average of 91.8 percent of manufacturers positive about their own company’s outlook over that time frame, compared to an average of 68.6 percent across the two years of 2015 and 2016. Manufacturers’ top concern remains the inability to attract and retain a quality workforce, and concerns about our nation’s crumbling infrastructure continue to rise. 1. How would you characterize the business outlook for your firm right now? 2. Over the next year, what do you expect to happen with your company’s overall sales? 3. Over the next year, what do you expect to happen with your company’s overall production levels? 4. Over the next year, what do you expect to happen with the level of exports from your company? 5. Over the next year, what do you expect to happen with prices on your company’s overall product line? 6. Over the next year, what do you expect to happen with raw material prices and other input costs? 7. Over the next year, what are your company’s capital investment plans? 8. Over the next year, what are your inventory plans? 9. Over the next year, what do you expect in terms of full-time employment in your company? 10. Over the next year, what do you expect to happen to employee wages (excluding non-wage compensation, such as benefits) in your company? 11. Over the next year, what do you expect to happen to health insurance costs for your company? 13. 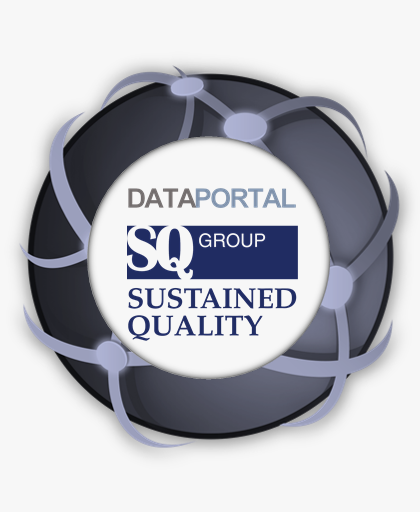 What is your company’s primary industrial classification? 14. What is your firm size (e.g., the parent company, not your establishment)? 15. How important is it for your company to have the new United States–Mexico–Canada (USMCA) Trade Agreement approved? 16. Has trade uncertainty negatively impacted your company’s business plans and outlook? 17. Do you believe the current state of our nation’s infrastructure is positioned to respond to the competitive demands of a growing economy over the next 10–15 years? 18. Would passage of a major infrastructure bill positively impact your company’s business plans and outlook? 19. Is our current immigration system meeting the needs of employers and businesses in the United States? 20. Have executive orders and administration actions on immigration negatively impacted your company’s business plans and outlook? 21. Please estimate on a scale of 0 (no change) to 100 (complete certainty) the probability of a recession in the United States in the next 12 months. 22. If Congress rolled back business provisions of the Tax Cuts and Jobs Act (e.g., by increasing the corporate tax rate, limiting the new deduction for pass-through business income or reducing incentives for capital equipment purchases), would your business consider reducing capital investments in the United States? 23. If Congress rolled back business provisions of the Tax Cuts and Jobs Act, would your business consider scaling back employment in the United States? 24. If Congress rolled back business provisions of the Tax Cuts and Jobs Act, would your business consider scaling back wage and bonus increases in the United States?